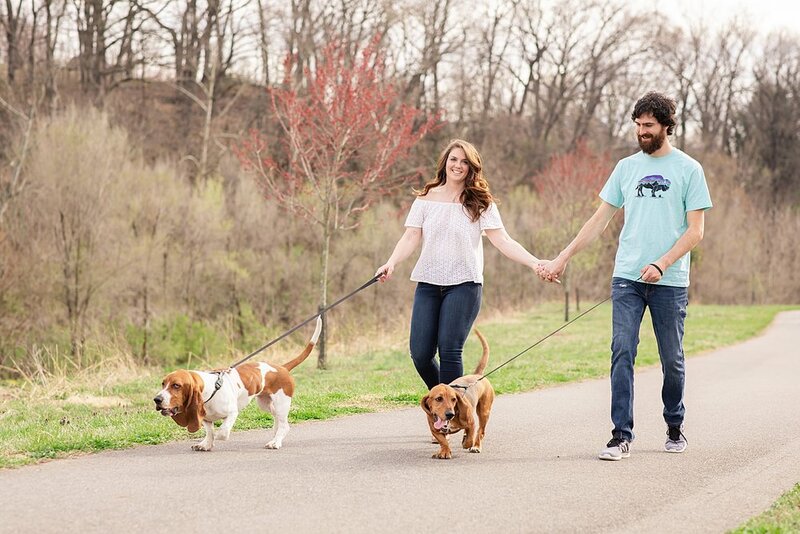 James and I had so much fun with this sweet couple and their babies!! We met Callie and her Momma at the Roanoke Bridal Show this past January. They stopped by my booth several times just to chat and thats when I knew that she was going to be a perfect EHP Bride! 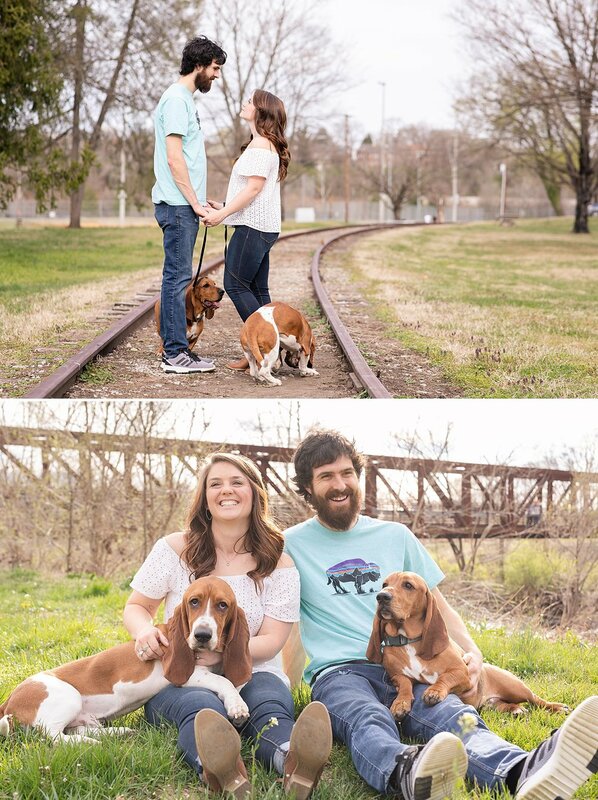 As we were planning the Engagement Session, it was very important to her and Matthew to include her Basset Hound pups, Howie and Clyde. 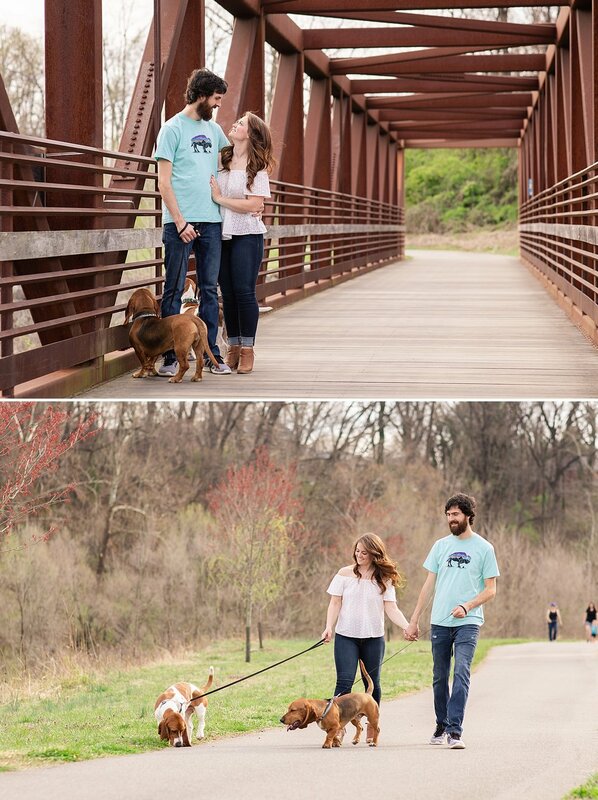 So we brainstormed some different locations that would be dog-friendly and still provide great spots for portraits. My Dad frequently runs in the Wasena area, and recommended Wasena Park for the Engagement Session. This area was perfect for the dogs and they behaved so well around all of the people! After getting some detail shots of Callie’s ring on the abandoned rail road tracks we found the one tree in the whole park that was blooming, and of course we had to take some portraits there! I had one other idea to do in the park, but our surprise guest, our skunk friend, changed our plans. I included the behind the scenes shot to show why we changed our minds! For the second half of the session, they wanted a pretty spot with mountain views. 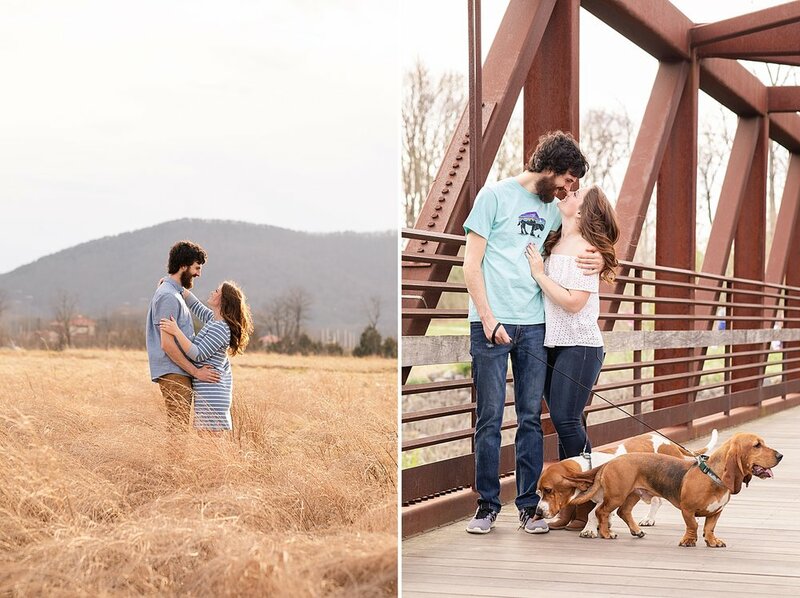 Earlier this year we took some Bridal Portraits at Greenfield Park and knew this was the perfect spot for open fields with some mountain views! They did a quick outfit change and we took some amazing portraits with the Blue Ridge Mountains as our back drop. 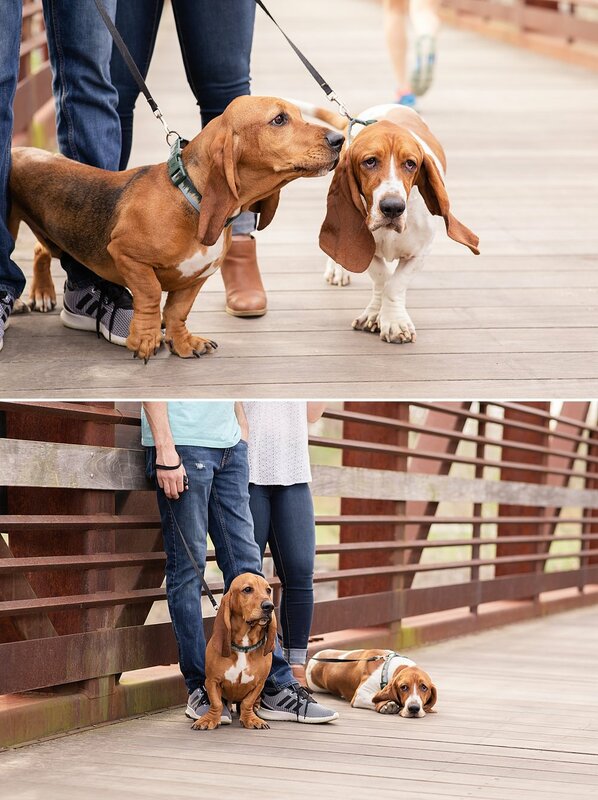 At the end of the session, we grabbed the pups for one last picture and they did not disappoint. Clyde was energetic the whole session, but particularly loved this last set! Howie on the other hand was pooped by this point. I released the pups to run to Matthew and Callie. Clyde ran straight to them, but Howie ran about half way and decided to walk the rest because he was just too tired! 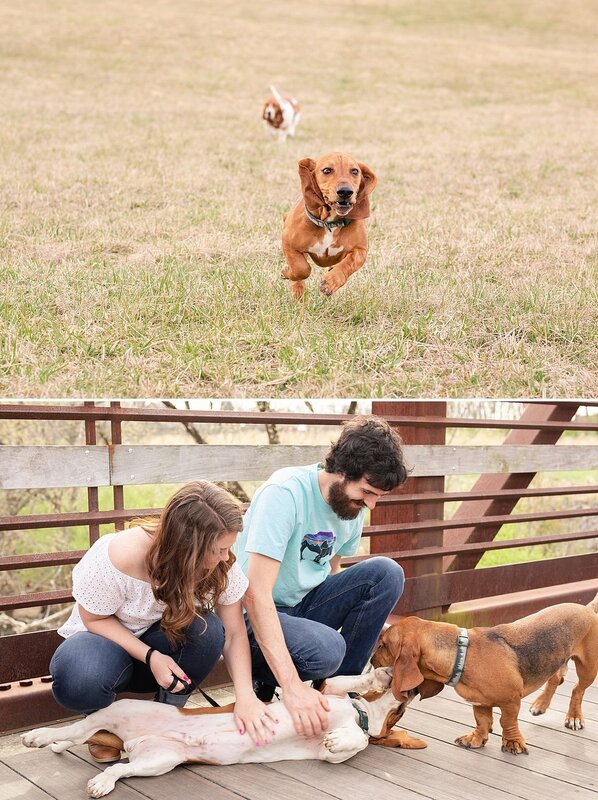 I loved hanging out with these floppy-eared Ring Bearer’s and can’t wait to see them again on the Wedding Day! 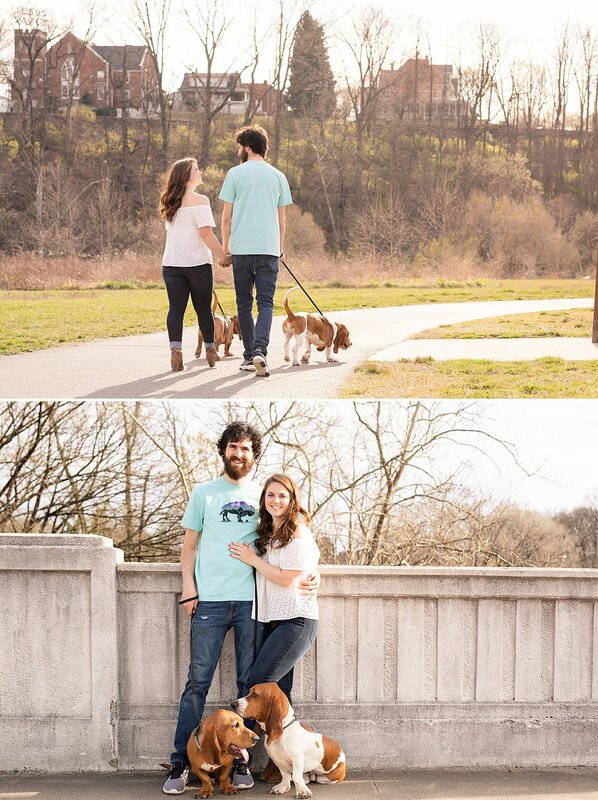 Callie and Matthew were naturals in front of the camera and made this Engagement Session a breeze. 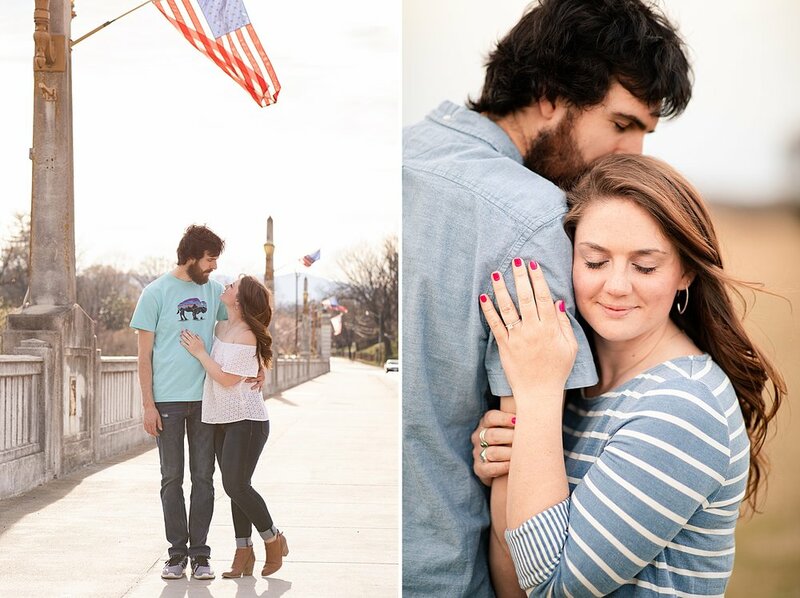 I can’t wait to see these two again for their Fall Wedding!! Love these two images! Both of them have an amazing “Model Look”. James could not have timed this shot any better to get just them on the bridge! We were trying to get the perfect shot of these four sitting down, but the dogs refused to look at the camera. So after trying to get their attention, I looked over to see what they were looking at. Low and behold, there was our little Skunk Friend! We quickly got up, and left the area. 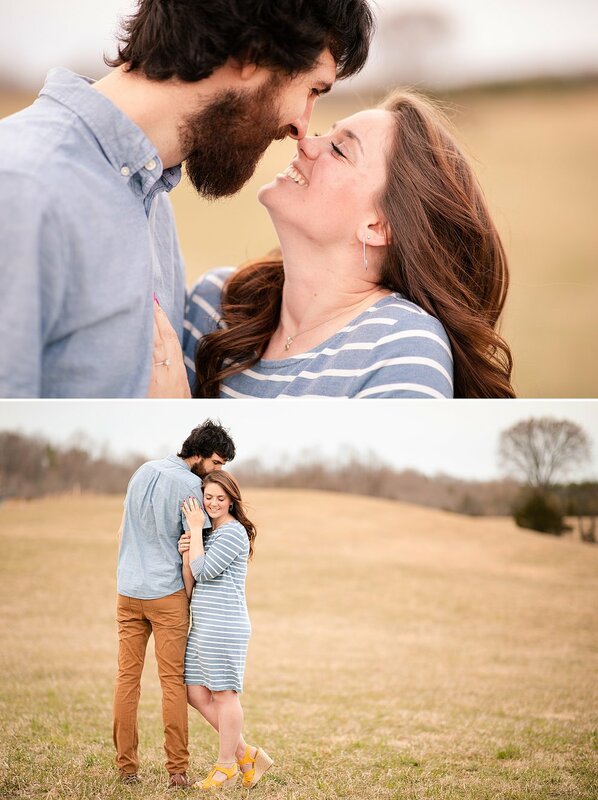 This has never happened before, so this was a great memory from our session! The abandoned rail road tracks made the perfect backdrop for these ring shots! I usually don’t like the the color yellow, but I am obsessed with these shoes!! Look at these cuties running! Howie is my spirit animal in this photo haha! !